We will examine the rationality of our individual and organisational fear when it comes to embracing the unknown. 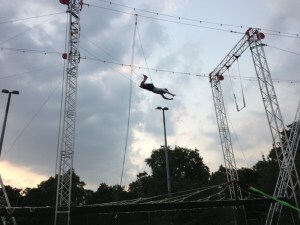 We’ll do this by experiencing a flying trapeze class at 40ft, amongst the trees in the beautiful surroundings of Regents Park at dusk. This evening session will bring together a small group of individuals who are dedicated to driving positive change in their professional and personal lives. Please join us in the exhilarating and kinaesthetic experience of letting go (of ladders, platforms, and bars), embracing something new (another’s arms) and swinging through the liminal space between. We hope this invitation will spark a mixture of excitement and fear which you embrace and challenge. This may seem an impossibly intimidating feat for many logical and irrational reasons – as is the case for many of the challenges in our day to day lives. Instead of giving in to fear and declining our offer we hope you will join us in attempting to navigate through it. We are firmly placing our trust in the highly trained professionals at Gorilla Circus and taking comfort in the fact that they are experts where we are novices. Although we may be moving into unchartered territory we are not about to make a blind leap of faith – technical expertise, a supporting harness, a safety net, will allow us to fall and pick ourselves up again without harm. The support and encouragement from others are key elements of success. Liminal space is defined as the space between – and it is through this space we must navigate if we are to achieve any kind of change – whether it is our own behaviour, society, business strategy or, for many of us our impact, on the environment . In short we must let go of something familiar to take up something new and the transition is often through unchartered territory. Fear of change and anxiety in the face of uncertainty is a primitive instinct with ancient roots. Mythology has sprung from a need to explain the natural phenomena we encounter in our day to day lives. To avoid resting in the uneasy shadows of the unknown we comfort ourselves with stories. The Stoics considered hope and fear as equally destructive emotions; as both are founded in unsubstantiated beliefs about the unknown future and distract us from engaging with the present. This event is free to attend but we only have a limited number of places so we are asking that you apply to attend by answering the following questions. 1. What is an example of liminal space in your professional life? 2. 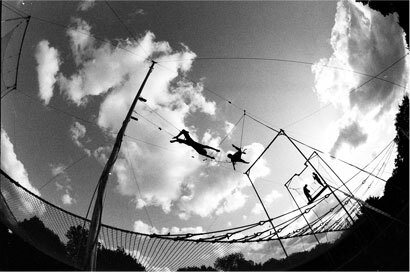 What leaps of faith will you have to make to cross it (or support others to make)? 3. Most importantly are you able to join us for a glass of wine after the event to share your thoughts on the evening (or better still write us a blog on the experience)? We want this evening to be followed up with story-telling and use our research into liminality and behaviour change to support decision makers into galvanising change. Please send all applications to Louisa Harris at Louisa.harris@6-heads.com by no later than Tuesday 12th August. And by no means last we would like to say a huge thank you to Grant Thornton for sponsoring us to bring you this experience and especially to Ian Smart for taking part last year and for supporting us to do it all over again! If you don’t already know us, 6heads is an experiment in shared learning. It is a collective dedicated to championing innovation towards sustainability. 6heads has a four-part theory of transformational change which works to: inspire, demonstrate, activate and learn. It is grounded in research and strongly linked to Imperial College. We’d love to hear from you, so please join our community, sign up to our blog (and write one for us! ), come to our events and most importantly have lots of fun with us.